It is satisfying as all get-out to interpret a Lenormand reading and/or a horary chart that accurately describes the location of a lost item, and then find the item. But sometimes a lost item stays lost. So when you ask where a lost item is, are you asking only for a description of its location? Or are you also asking if you’ll find it, even if you don’t say that in so many words? A reading I did a few months ago suggests the latter. My friend J. has a friend who had lost a set of keys to a home safe. J. asked me about the keys on her friend’s behalf. The Lenormand reading and the horary chart both gave meaningful answers, but as of this writing, the keys haven’t been found. And even if they do turn up someday, for all practical purposes, it’ll be too late. J’s friend was going to have new keys made. Once that was done, the original keys may as well stay lost. I took my “usual” approach to doing a lost items reading. (“Usual” meaning I’ve done this maybe three or four times now: so much experience!) I choose a card ahead of time as the significator of the lost item, shuffle the deck, look for it in the deck, and lay out the card before it, the significator itself, and the two cards after it. The one card before would show the past; it’s the equivalent of “When did you last see the keys?” The two cards afterwards should show the present/future location of the lost item. Choosing the significator was easy: lost keys cry out to be represented by 33-Key. It never occurred to me that the Key might be the last card in the deck. Which it was. Here’s that issue I was talking about. I’d asked where the keys were. The most straightforward reading of this was that the keys had no present or future location. (The past location, 20-Garden, which suggested they might’ve been in the garden or at a gathering, didn’t help any.) It was possible that the keys had been destroyed, and that would answer the explicit question Where can she find her missing safe keys?. But the keys only needed to be permanently lost, nothing as dramatic as utterly obliterated, if the reading was answering the implicit question Will she find her lost keys? No “future” for the keys: the answer is No. I admit I didn’t trust my intuition. And I hadn’t realized that there were two questions involved; I was only thinking of the explicit one. Since it seemed unlikely that the keys had been destroyed, they should be somewhere, so I took the first two cards from the top of the deck to find out what that somewhere was. The first card was 23-Mice. One interpretation of the Mice is that the keys had been stolen; another was that they were permanently lost. The second card was 34-Fish. It suggests the keys were near J’s friend’s financial materials, which makes sense given that they were the keys to one of her home safes. But as they do seem to be permanently lost, we’ll never know. The Mice may have been the absolute end of the reading (“Look,” the cards grumbled, “we told you they had no future, and then we told you—again—that they were lost. How much more of an answer do you need? !”), and it wouldn’t matter what the next card was. To make this post easier to read, I’ve separated the Lenormand reading from the horary chart reading. But at the time, I was going back and forth between them, so I hadn’t reached that conclusion about the Lenormand reading before I’d started working on the horary chart. This was one of the times I went with intuition when choosing the significator. I could have used derivative houses, but it was turning into a long chain. That’s not necessarily a bad thing, but the best I can say here is that it didn’t feel right. Mercury is the natural ruler of keys, and like choosing 33-Key in the Lenormand, it seemed much more reasonable to use it as the significator of these keys. 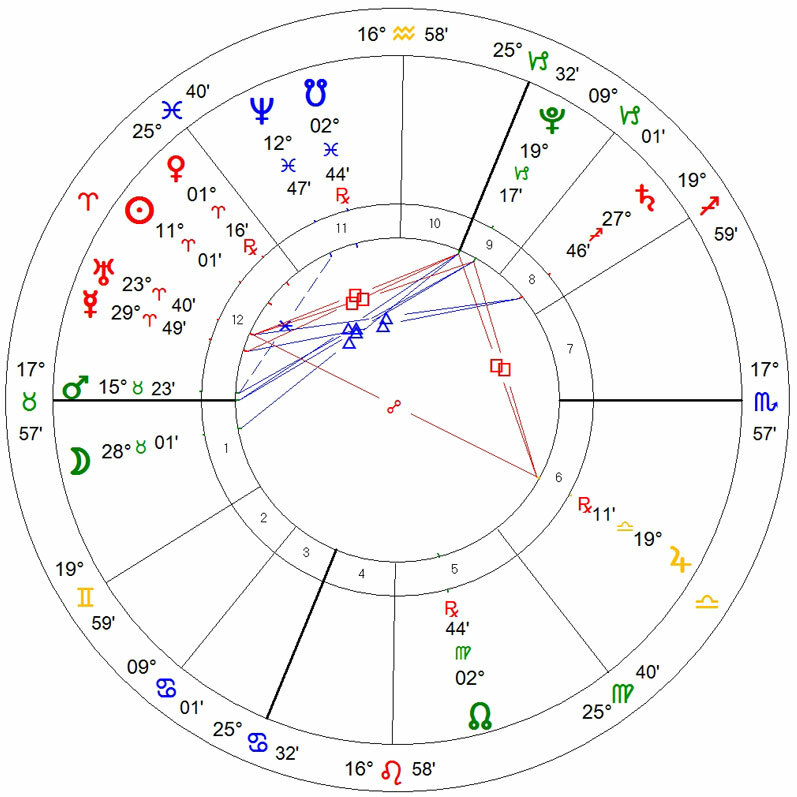 Saturn in the 7th house and/or the ruler of the 7th house afflicted? Yes to the latter: Mars is the ruler, and isn’t comfortable in Taurus. Moon in the Via Combusta? No. Void-of-course means that the Moon (or a planet) will not make an exact aspect with any other planet before it moves into the next sign. It may still be in aspect to one or more planets, approaching and separating, but nothing else will match it exactly before it goes into the next sign. The tag line for the void-of-course Moon is “nothing will come of it.” Whether that’s helpful or not depends on the question asked. I wouldn’t say it’s all that encouraging in a lost items question, not unless you wanted the item to stay lost. Among other things, the 7th house represents the astrologer who’s interpreting the horary chart. (That’s me.) Saturn in the 7th house or an afflicted ruler of the 7th suggests the astrologer will have problems with the chart or suffer a delay in understanding it. Or, in my case, be a bit oblivious to her own intuition. Mercury is at 29° 49′ Aries. That’s right at the end of Aries (each sign has 30º), and horary texts have explanations for significators that are right at the end of signs and what that means for lost items. But in this chart, Mercury is also void-of-course. See everything above about about the VOC Moon, and apply it to the keys themselves. Mercury isn’t connected to anything, symbolically, so the keys aren’t connected to anything or anyone, including J’s friend. They’re in a void somewhere, not to be found. No keys. No future for them, according to the Lenormand reading. No ties between them and anything else according to the horary chart. It’s good to know that these readings can tell you if you’re ever going to find a lost item, but I wish the problem had had a happier answer.